At six, the artist clearly knows he is not Picasso, and not Chagall: “My name is Asher Lev,” he tells his uncle as the play unfolds. The painter’s quest for powerful artistic expression drives a wedge between him and his Hasidic roots. Guided by his heart and his paintbrush, Asher learns to show the painful truth in his works. 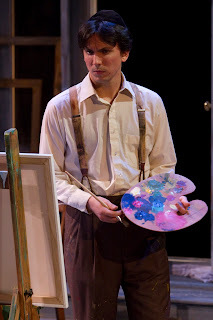 Aaron Posner’s artful adaptation of Chaim Potok’s novel, presented in by the Delaware Theatre Company is a co-production with the Round House Theatre of Bethesda, Maryland. This tightly-wound tale, directed by Jeremy Skidmore, gets to the heart of Asher’s conflict with beautifully acted scenes and well-crafted dialogue. Potok grapples with some heavy thematic material: the artist’s role in society and his responsibility to his own culture. In a way, the story is a “play within a play”. The age-old Pygmalion theme runs through the story: Asher is mentored by Jacob Kahn (played by Adam Heller), a famous artist who views the young prodigy as his own marble, ripe for sculpting. When Asher realizes he cannot distract his mother from her sorrow by painting the birds and flowers she requests, he is already well on his way to painting the ugly truth, and Kahn guides him in expressing his perceptions of the world, his family and culture on the canvas. Alexander Strain is moving in his portrayal of the young artist. He conveys with finesse the character’s bewilderment at his talent, wonderment of his neighborhood with its endless subjects for sketching, as well as his devotion to his parents. Though the actor never leaves the stage, he transports us, scene by scene to different locations and times in his life. After his beloved uncle Yitschock dies, Asher becomes unable to paint for three long years. His mother, played by a sympathetic and versatile Lisa Bruneau, bemoans the loss of his art. Bruneau handles her role as a traditional Hasidic wife and mother who is torn by her son’s unquestionable talent and the rift it causes with her rigid scholar husband. As Anna, Kahn’s assistant and manager, Bruneau’s change in posture and behavior was so striking, I had to look in the program just to be sure there wasn’t a forth actor. Each time Asher parts with a painting, he parts with a piece of himself, and it is painful for him. The audience is completely willing to believe the attic room, which never changes configuration- is his parents home in Brooklyn, his teacher’s studio, and the artist’s childhood bedroom. The painted canvasses stacked along the walls and the spattered paint and the gloomy windows and skylights remind us we are in an artist’s den, and perhaps metaphorically, in his mind. The canvasses he does show us are all blank, allowing the words to paint images for us. As Asher’s stern father, Aryeh, Heller is unbending and almost cruel. The actor shines as Kahn, the crass mentor, whose thick slab of Brooklyn accent and self-observations bring comic light to the show. Heller’s subtle changes in voice and posture age his characters and help bring to life this story of self-discovery and artistry. For more tickets and information, and to learn about DTC’s other exciting productions and events go to: http://www.delawaretheatre.org.